We were somewhere in Benewah County, Idaho, on a resplendent late April afternoon in 1993. I had planted the last of my trees for the day, shouldered my hoedad and was walking down a skid trail, eyes on the fertile valleys spread out below us, the coil of blue silver river, the great yawn of gentle mountains, patched with clear-cuts like the one we’d been working in, but still possessed of a surpassing beauty, rich, rain-drenched forests of a thousand shades of green shimmering in the sunlight and shadows of passing clouds. I was singing, happy in the way of things then, with a hard day’s work behind me, near the end of a month of swinging my hoedad — a flat-bladed tool designed for tree-planting — on steep slash-strewn ground. I’d be home soon, with money to burn, adventures planned, a bed to sleep in and a wife to share it with. A couple of fellow planters boot-slid down the cutbank and joined me. Miguel, a wiry planter from Michoacán, Mexico, asked me, “Te gusta mucho trabajar, no?” “Claro que si,” I answered. Yes, indeed. I love to work. Of my many seasons of working in the woods of the West, I remember that one best. My work partner, Barry Davis, and I were the only English speakers on that crew. Neither of us minded, since everybody’s wages were more than decent. We were pulling down $500 to $700 a week at a time when the minimum wage was $4.25 an hour, and that crew, run by a company called Evergreen Forestry of Coeur d’Alene, Idaho, was an uncommonly good one: a band of uncomplaining, hard-working, hard-partying and often very funny obreros — workers. I had some good times in Mexico when I was younger (I majored in Latin American studies in college), and I was working hard on regaining my Spanish. Davis, a wild-haired, wild-bearded man of about 40 who lived in his truck in Montana’s Bitterroot Valley when he wasn’t working, was an anarchist and rabble-rouser who believed in the international brotherhood of laborers, and he fell right in with the obreros, although he didn’t speak Spanish. After five weeks planting in Idaho and Washington, some of the crew came to my house in the Bitterroot Valley to celebrate the good season, drinking and shooting pool at the Rainbow Bar in Hamilton and hanging out on the river. None of us knew it then, but we were witnessing the end of a long era of Western woods-work, the end of tree-planting, timber-thinning and most other manual labor on the public lands, at least by American citizens like Davis and me. We had gotten on that crew by responding to an ad for planters in a Montana newspaper, driving almost four hours in my gas-hog 1977 Ford 150, loaded with camping gear, hoedads, and groceries. But when we arrived at Evergreen’s offices, the white American man we spoke with grinned and said, “We don’t actually hire Americans for these jobs, you know. The ad was just there because the law says we have to place it.” I was dumbfounded. Davis, who came of age working on the big tree-planting co-ops where every planter was a part-owner and dissent and the power of the rabble were celebrated, looked the man dead in the eye. With an almost gleeful smile, he threatened to report him to the local Better Business Bureau. We were hired immediately. 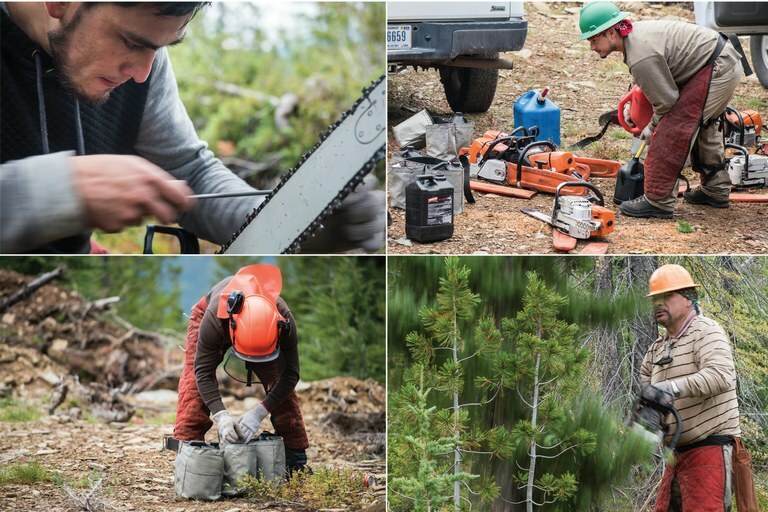 A crew of H-2B visa holders works a thinning project in the North Fork Thompson Creek in Montana’s Lolo National Forest. Clockwise from left: Miguel, who didn’t give his last name but said he’s from a small town south of Mexico City, sharpens his chainsaw. Sawyers fuel chainsaws and put on safety equipment, then load tool belts with oil, fuel and tools; the crew chief, Eduardo, who didn’t give his last name, fells a fir tree. When the crew he manages for Imperial Forestry Inc. of Medford, Oregon, is working smoothly, he fills in as an extra sawyer. But no rabble-rouser could stop the trend, and it became clear that no Better Business Bureau or government agency would try. By the time I quit forestry in the late 1990s, after nearly 20 seasons, few U.S. citizens of any ethnicity were working forestry jobs in the West. A new narrative had entered the American conversation: Tree-planting, like thinning timber, picking cherries or peaches, milking cows, tending strawberries in pesticide-laden fields, and so on, were all declared jobs Americans won’t do. Manual labor, even skilled manual labor, has become the province of desperate men and women imported from foreign lands. The narrative reveals hypocrisy in our national politics on both the left and the right. As I write this, the smoke has just cleared from one of Montana’s worst fire seasons. The state’s new congressman, Republican Greg Gianforte, is planning a “Forest Jobs Tour” to promote the idea that the fires resulted from a combination of U.S. Forest Service inaction and environmental litigation that has shut down public-lands logging and thinning. Absent is any discussion of the Republican Party’s relentless efforts to strangle the budget of that same Forest Service. No one mentions the fact that, should a vast renaissance in thinning timber occur, none of the jobs would go to locals, since the H-2B guest-worker program — which President Donald Trump and Republican congressmen want to expand — already boasts 9,434 forestry workers, many of whom work on public lands adjacent to Western communities with soaring unemployment rates. On the left, the concern with the rights of immigrants, documented and undocumented, contrasts with an apparent indifference to the fate of native-born Americans in places like Clearwater County, Idaho, or Superior, Montana. Disappearing are the debates environmentalists once had about immigration and the impacts of overpopulation. There is not enough discussion of how the millions of marginalized, hungry people in the labor market suppress wages and displace American workers. Some of the staunchest advocates for the public lands seem relatively uninterested in the future management of those lands. And two important questions go almost unasked: Why are so many rural Westerners, surrounded by public lands, some of the harshest critics of the Forest Service? And why are they among the loudest voices calling for transfer of federal lands to the states, or for their outright privatization? Members of the Hoedads cooperative, which operated in the Pacific Northwest in the 1970s and early '80s, replant an Oregon forest after a logging project. Hal Hartzell not only lived in the golden age of Western forestry contracting; he helped create it by co-founding, in 1972, the legendary crew known as the Hoedads. Now the co-owner — with his wife, former tree-planter Betsy Hartzell — of Kalapuya Books in Cottage Grove, Oregon, Hartzell chronicled his time in the forests in the book, Birth of a Co-Operative: Hoedads, Inc., A Worker Owned Forest Labor Co-Op. In the summer of 1972, Hartzell was home from a two-year Peace Corps stint in West Africa. And, as he writes in his book, he was “wandering around town trying to get used to the fast pace of Eugene,” Oregon, when he met Jerry Rust and John Sundquist. They had learned hoedad tree-planting in the winter of 1969, working for a contractor on private timberland. It was while working that job that they realized that not only was the work being done poorly; the contractor was taking home the vast majority of the money. Their plan, as Hartzell later wrote, was to assemble a group of workers committed to planting trees that would survive to become forests, and to conduct business as a worker-owned cooperative, where every member was paid according to how much he could produce. The small crew started with federal Bureau of Land Management contracts and soon moved up to larger contracts on the Umpqua National Forest. They called themselves the Hoedads. The Hoedads’ successful 20-year run was never without strife. The co-op almost dissolved as early as 1983, and there were annual issues with unwise bids and cash flow. Bookkeeping, given the co-op model, was always a nightmare, especially in the face of an increasing thicket of state and federal regulations regarding labor and wages. By 1994, Hartzell said, “We decided to call it quits. The foreign crews had started showing up in the 1980s, and it had been getting harder and harder to compete with them.” Further hastening the co-op’s demise was a series of lawsuits from a group called the Associated Reforestation Contractors (ARC), created specifically to challenge the worker-owned business model. ARC claimed the co-ops had an unfair advantage because they were exempt from workers’ compensation and other expenses. “A lot of brouhaha started when the ARC sued us,” Hartzell said. ARC won the suit, and then disbanded in 1985, “having fulfilled its mandate of contesting the threat of tree-planting cooperatives on public lands,” according to Brinda Sarathy’s book Pineros. Other factors also contributed to the fall of the co-ops. The Knutson-Vandenberg Act of 1930 had mandated that revenues from public-lands logging be set aside for a range of reforestation operations. The model was successful while the timber industry boomed, but when logging declined on public lands during the 1980s and ’90s, the funds slowed to a trickle, leaving less money to pay for forestry and for anything else that the Forest Service needed to do. That, and the unwillingness of Congress to fully fund the agency to make up the difference, opened the doors to contractors who would work more cheaply. And the “brouhaha” that Hartzell describes? It was the smoke from what was becoming a raging battle for the future of forestry contracting. It was a take-no-prisoners war that would eventually take down the local planters and sawyers in rural communities as well as the hippie co-ops. It also destroyed the chances of migrant forestry workers to command anywhere near the wages and working conditions that the co-op workers achieved. Scenes from the early days of the Hoedads, a worker cooperative that grew to 600 core members, with up to 18 crews working in eight states, top left and right. 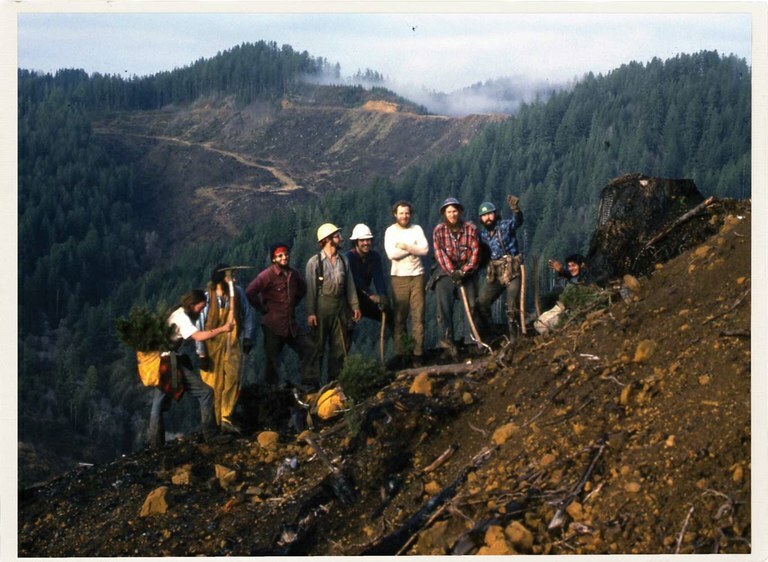 Another Oregon crew, Rock Creek Reforestation, lower left, run by the Stokes, circa 1986-’87. 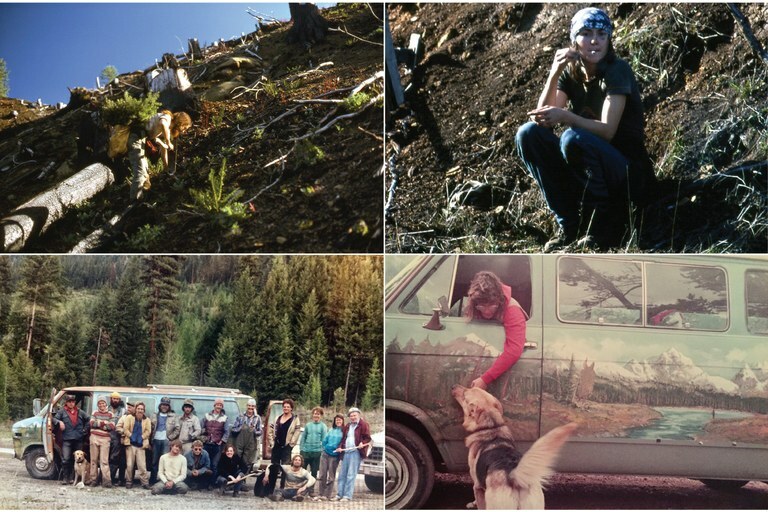 Lower right, forest worker Doreen Stokes in her van or “crummy,” in forest-worker lingo. As soon as the Hoedads and other pioneering co-ops opened the doors to a new way of forestry contracting and working, they were followed by a flood of hungry competitors determined to take over the niche they’d created. For decades, migrant workers were an integral part of agriculture in western Washington and Oregon. As tree-planting and other forestry work increased, it was natural for these workers, accustomed to hard outdoor labor and often lacking winter employment, to seek out those forestry jobs and frequently excel at them. But they soon found themselves in the same position as the co-op workers, as unscrupulous forestry contractors swamped the market with undocumented workers who were far less capable of negotiating for higher wages or better working conditions, or much of anything else. 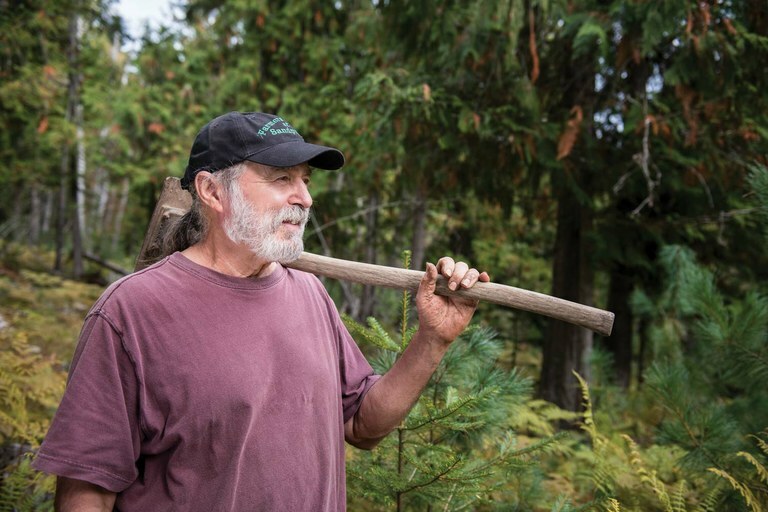 Thom Sadoski, a retired tree planter who was part of the Small Change forestry cooperative in the 1980s, holds the tool of the tree-planter trade — a hickory handled, steel-bladed, hoedad — on his farm in Sandpoint, Idaho. The lawlessness and the outright abuse of migrant workers eventually attracted the attention of an alphabet soup of regulating agencies. But it would be years before those agencies, and their regulations, began to have an effect on the industry, and those were some of the most eventful years, as far as labor markets and the movement of workers were concerned, in U.S. history. In 1986, President Ronald Reagan signed the Immigration Reform and Control Act (the famed “Reagan Amnesty” still decried by anti-immigration activists), which legalized almost 3.2 million migrant workers living in the U.S., most of them from Mexico. The act also led to the creation of the H-2B Visa program, which allowed for a maximum of 66,000 non-agricultural laborers to be imported for seasonal work in the U.S. (The Trump administration has lifted that cap to 81,000, a blow to the nativist voters critical to Trump’s election.) 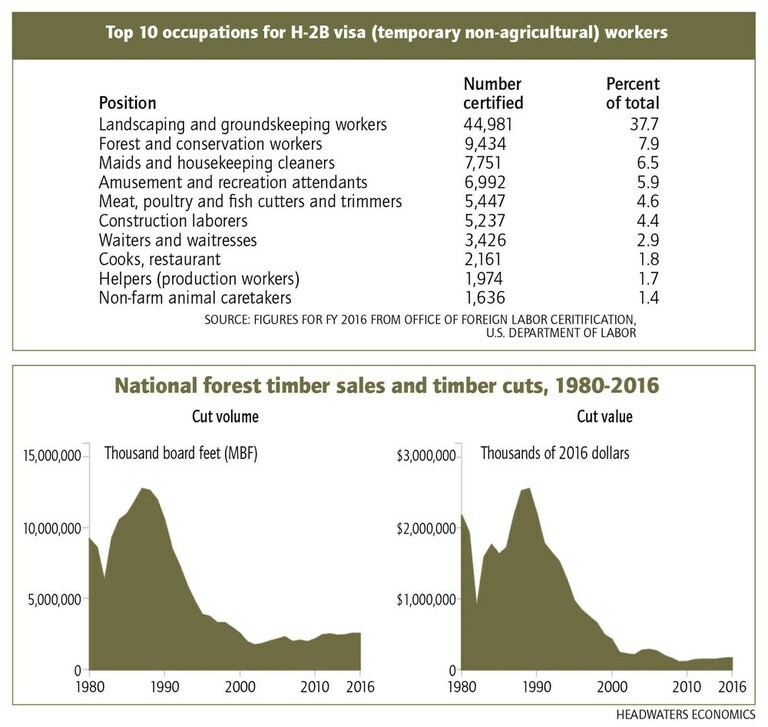 By 1991, the forestry contracting industry was using 21 percent of all H-2B visas. The H-2B program was supposed to rein in some of the lawlessness of the era when crews were made up almost entirely of undocumented migrant workers. And in some ways the situation did improve, for a while. By 2005, said Pennick, “The Border Patrol had cracked down, and the Forest Service had a better line on all of it, everybody had pretty much cleaned it up.” Still, the economics were the same as before. The H-2B workers were willing to work for less money, and so the bigger contractors could outbid the smaller, more local ones. The H-2B program replicates the power relationships of indentured servitude. Break your contract, and don’t leave the country, you become a criminal. … You can’t have a program where workers are held like that. And with forest fires devouring over half of the Forest Service’s annual budget, the agency has little choice but to go with the cheapest option. “We’re robbing Paul to pay Peter every year with these budgets,” said Pennick. “With the H-2B crews, it is true that gas, food, lodging, is the only money that is coming into the community — it is like Wal-Mart in that way, there are people working there, but the profits are going elsewhere. But for the resource, for getting the work done, after the main troubles were worked out, these big crews have benefitted the forest. But as anyone who has ever been involved in a struggle for higher wages or better working conditions can attest, the inability to complain, whether because of fear or language barriers, does not make for a secure work situation. Employers have exploited H-2B workers since the program began. In 2007, the Southern Poverty Law Center’s Close to Slavery: Guestworker Programs in the United States outlines a multitude of abuses. The SPLC filed a 2005 lawsuit on behalf of 4,000 H-2B tree-planters from Guatemala and Mexico, that, in 2012, produced a record-breaking judgment of $11.8 million against forestry contractors Eller and Sons Trees Inc. of Franklin, Georgia, with the judge ruling that the workers had been systematically cheated out of their wages for years. A 2015 Government Accountability Office report on the H-2A (agricultural) and H-2B (non-agricultural) visa programs documented a number of abuses, such as third-party recruiters charging prohibited fees to prospective visa holders, and employers providing inadequate or false information about jobs, working conditions and wages. From 2011 through 2013, according to the report, the National Human Trafficking Resource Center received over 1,400 complaints from H-2A or H-2B workers alleging labor violations. Along the once-bustling streets of Superior, Montana, men who hold H-2B visas for contract work for Imperial Forestry of Medford, Oregon, walk back to their hotel after a quick trip to the grocery store. In 2012, fresh outrage erupted when the Department of Labor’s Inspector General revealed that at least $7 million of federal stimulus money had gone to pay the wages of 254 H-2B forestry workers in parts of rural Oregon where the unemployment rate was around 20 percent. According to Charles Pope in The Oregonian, the companies using the H-2B workers technically complied with the law by advertising job openings, but did so by placing ads only in small-town California newspapers. Deb Hawkinson of the Forest Resources Association Inc., a Washington, D.C.-based lobbying group that represents loggers and other forestry-related industries, refused to go on the record for this story. But her organization’s stance is summed up on its website, where one of its top priorities for 2017 is: “Overregulated: H-2B Guest Workers in Reforestation.” During a short interview, she told me that the kind of labor for which H-2B workers are recruited does not appeal to American workers, and that there is no way that businesses who need this kind of labor can rely on American workers. Hawkinson’s assertion that manual labor such as tree-planting, thinning timber and fuel-reduction logging is the kind of work that no modern Americans want to do comes up over and over again. There is, of course, a built-in conundrum in the question: As long as we have thousands of poor migrants, willing to plant our trees for $13.85 per hour or less, and as long as local Americans are actively discouraged from taking such jobs, we’ll never know the answer. But I do know that at one time, when wages were comparatively high, I preferred woods-work over any other employment, and I knew plenty of people across the West, and in the South, who felt the same way. I drove to Plains, Montana, to visit Jim and Doreen Stokes, whom I’d last seen a quarter-century ago, in the pouring rain on a tree-planting contract in the Bitterroot Mountains. I worked as a sawyer for their company in 1993, cutting yew trees for the cancer drug Taxol on the Nez Perce-Clearwater National Forest near Pierce, Idaho. For about $15 per hour, our team would go in to the cutting units and fall and buck enough yew trees to keep a band of 20 or so bark peelers, also making $100 or more per day, busy. The Stokeses live on their Eagle Creek Farm about 20 miles from Plains, with a comfortable home they built themselves, fruit orchards, barns, hayfields and gardens, close to the Clark Fork River. They’ve been there 33 years, and they’ve been a team, contracting tree-planting and thinning, and working at whatever would pay the bills, for a lot longer than that. Jim is a farrier and a contract horse logger, and the couple still contracts reforestation and restoration work on state and private lands. When I worked for them, they were always headed to somewhere exotic at the end of every forestry season — Zanzibar, Costa Rica. Doreen has been travelling to Tanzania for tree-planting and rural water supply projects in recent years, taking students from the U.S. and showing them how to plant trees and introducing them to the Maasai people. Their SUV sports bumper stickers declaring a preference for organic farms and an unequivocal distrust of our current president. 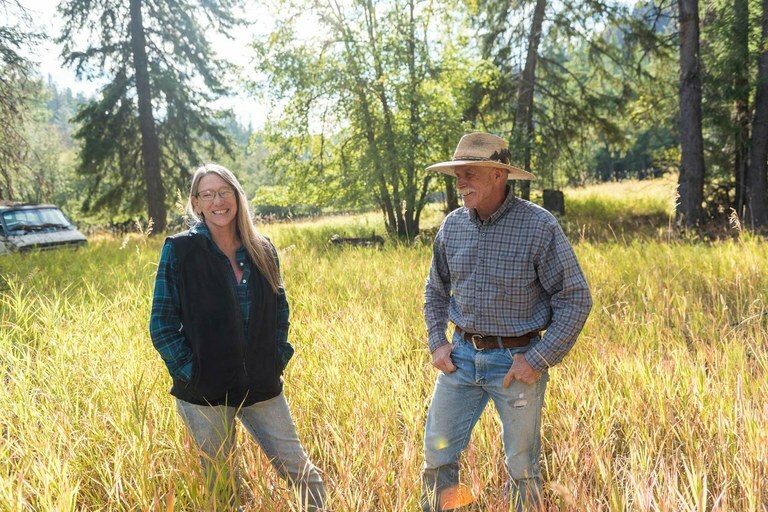 Doreen and Jim Stokes, who owned a tree-planting contracting company during the boom days, continue to work in the forests any way they can, despite the lower pay and reduced opportunities. On their property near Thompson Falls, Montana, is one of the vans known as a “crummy” they used to haul workers in their early forest contracting days. Perhaps the best hope for a response is in Missoula at the University of Montana’s Forest Industry Research Program at the Bureau of Business and Economic Research. Chelsea McIver, a research specialist there, is Jeff Pennick’s daughter and a veteran of 13 seasons’ working for the Forest Service on trails and other labor jobs. She grew up around Hope, Idaho, as a self-described “Forest Service brat” who planned a career in the same agency. But it didn’t work out, in large part because the Forest Service is not the robust, forward-looking agency that it once was. 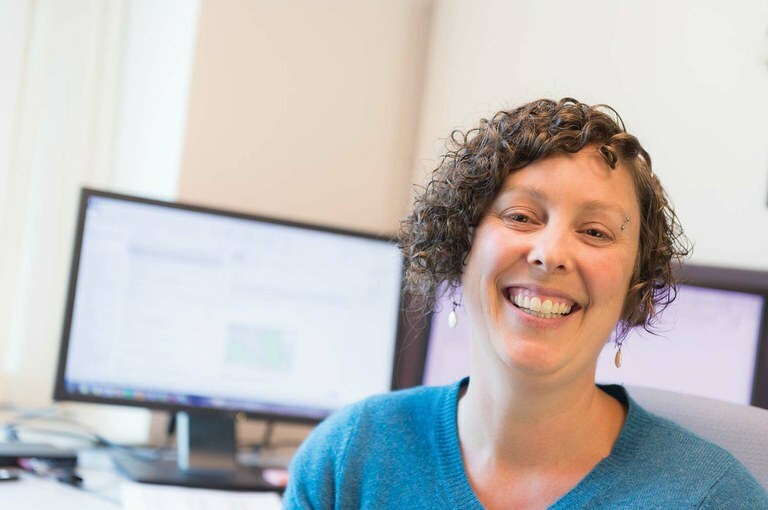 Chelsea McIver, who grew up as a “Forest Service brat” and planned a career with the agency, looks for new ways to help foresters and their communities in her job for the Forest Industry Research Program at the University of Montana’s Bureau of Business and Economic Research. McIver and I toured the Marshall Woods Project, over half of which is on Lolo National Forest land north of Missoula, including the Rattlesnake National Recreation Area, one of the city’s most popular playgrounds. It’s a 13,000-acre project, with 4,000 acres of thinning, planting, weed control, brush-piling and controlled burning. There are years of work here. The project originally was designed with options to award contracts to local workers. There was also a commercial logging component on about 225 acres, where the timber needed thinning, but the trees were too large for workers to cut up, pile and burn. The sale of that timber would have brought in some money to help pay for the project, and allow for flexibility in awarding the bids to locals. But some local environmentalists vigorously objected to commercial logging on the project. “There had already been so many delays,” McIver said. “The Forest Service just had to take the easiest path.” By the time work began in 2016, the commercial logging aspect of the project had been dropped. So had any attempts to award contracts to local workers. Imperial Forestry of Medford, Oregon, got the main $1.75 million contract. This year, the company received 114 H-2B visas for forestry work with a $10.23 per hour base pay rate, according to the Bureau of Labor Statistics. Chit Wood and Andrew Dziadosz catch a ride on the tailgate of the crummy after clearing brush with Alber’s crew. Irish setter Maria is a fixture on the crew. At least one local contractor, using locally sourced crews, would have liked a piece of the project: Mark Alber, of Miller Creek Reforestation, an old-school thinning and firefighting contractor with a dedicated crew based out of the Bitterroot Valley. 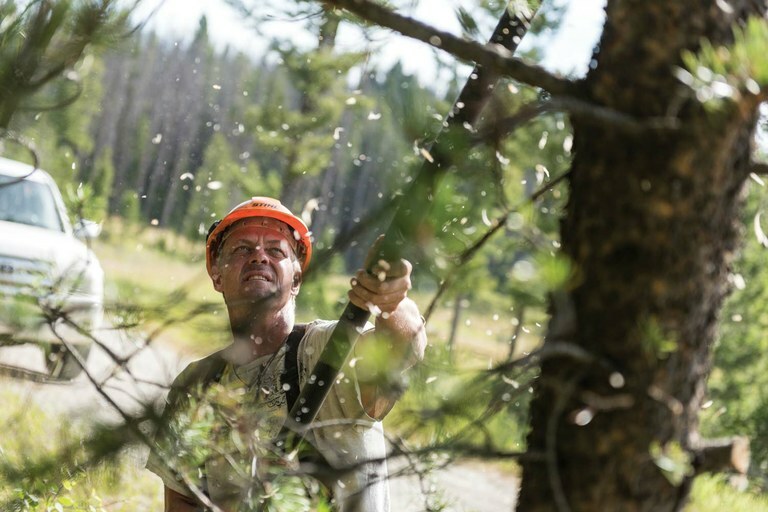 Mark Alber uses a gas-powered pole saw, right, to trim branches along a road in the Beaverhead-Deerlodge National Forest, Montana, clearing the way for a scheduled timber harvest. Alber, who owns a forest-contracting firm in Montana's Bitterroot Valley, says that since he's committed to paying his workers a living wage, his bids for projects can't compete with those from big, outside firms that use H-2B visa workers and other low-wage laborers. There is a reason for that lack of caring, and like the complex ecology of labor markets and their effect upon human lives, it is not immediately obvious. For the last 20 years, I’ve been a reporter and writer focused on our public lands, particularly efforts to transfer Forest Service and BLM lands to states or into private hands. The Republican Party’s platform includes a long-term goal of privatizing public lands. The short-term goal is for the system of public lands not to work; to strangle the budgets and diminish the role of once-proud agencies like the Forest Service, make sure that Western communities do not profit from or engage with the public lands that surround them, ensure a constant level of conflict and uncertainty, and import laborers in areas of high local unemployment. These goals may not be part of a vast right-wing conspiracy, but they serve the goal of eventual privatization just as surely as if they were. Strangely enough, we Americans have made the decision to embrace a libertarian, devil-take-the-hindmost capitalist approach to labor and contracting on our public lands, the same lands that are perhaps our best remaining example of a shared national vision, a vision that defies the raw and bloody arithmetic of markets and bald statements of profit and loss. It’s a profound contradiction, one that has resulted in fewer and fewer American citizens working on our own public lands. We can argue about whether a poor man from Honduras or Mexico, lured here to work on our public lands, is being exploited or being given opportunity, or both, but we cannot escape the fact that the model we have embraced has resulted in lower wages and far fewer opportunities for all the people — of whatever origin or ethnicity — who actually live in the West. We can shrug it off as the global free market at work, but there is little doubt that it is hollowing out communities like Pierce, Idaho, and Darby, Montana, and no doubt at all that it is fueling the booming anti-public-lands movement. Lost are generations of young people who take pride in their own strength and abilities, drawing decent wages from the use of muscle and common sense to solve problems and improve their own public lands. 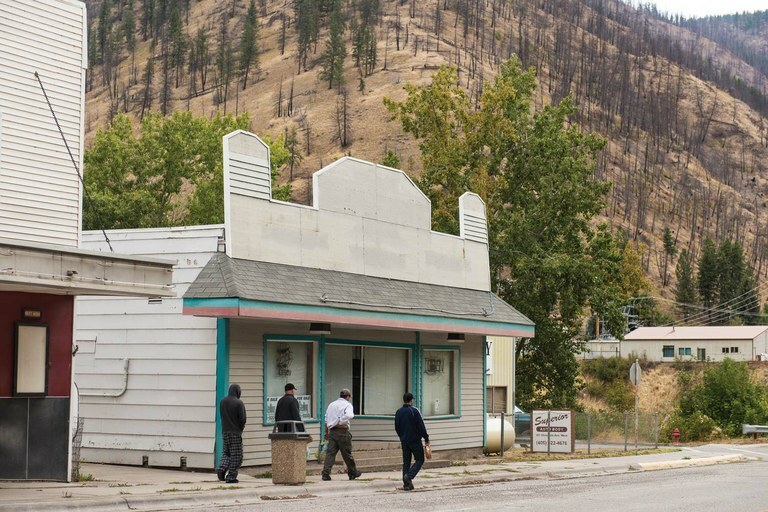 Swept into this vortex is the economic connection that small communities once had to the federally managed public lands that surround them, and that, increasingly, are seen as hampering, rather than encouraging, economic prosperity and quality of life in the West. This story was produced in collaboration with the Food & Environment Reporting Network, a nonprofit, investigative news organization, and with reader donations to the High Country News Research Fund. Hal Herring, a contributing editor at Field and Stream, wrote his first story for HCN in 1998. He covers environment, guns, conservation and public-lands issues for a variety of publications.